Something is rotten in the state of your Windows PC. Here's how to deal with a computer that keeps rebooting. Yes and maybe. There’s a setting you can change that will give you at least a hint of the problem. But the hard part starts after you get that hint. So let’s get you to a point where your crashes contain some useful information. Go to the Search tool in your version of Windows, type sysdm.cpl, and select the program of the same name. 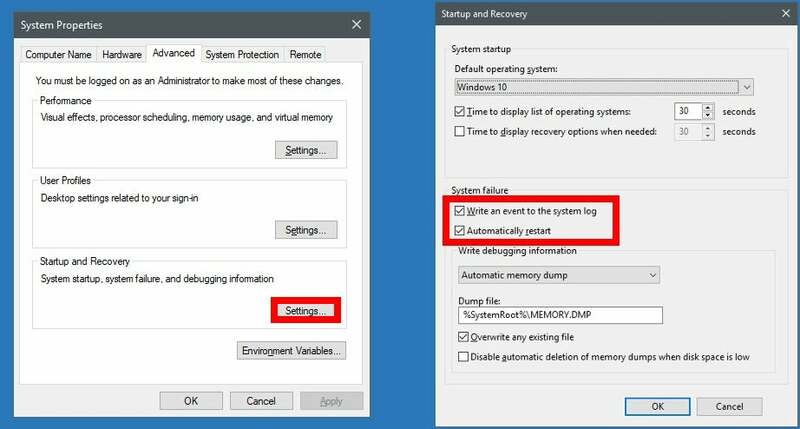 Click the Settings button under Startup and Recovery (as opposed to the dialog box’s other two Settings buttons). You might also want to check Write an event to the system log if it’s not already checked. System Properties windows in Windows 10. From now on, your system won’t simply reboot when it can’t keep going. Assuming you’re not yet running Windows 10, you’ll get a blue screen filled with intimidating text. Microsoft calls this a Stop Error, but everyone else prefers a more descriptive term: The Blue Screen of Death (BSoD). With all that text on the screen, what should you look at? First and foremost, the second paragraph on the screen, which will be in all caps. Make a note of that. Also note the “Technical information” at the bottom of the screen. But that second paragraph near the top contains the most useful clues. For Windows 10, Microsoft redesigned the BSoD to make it less frightening. I like to call this new version the Blue Face of Death (although it’s really more of a Cyan Face of Death). Let’s see if that nickname catches on. Whatever you call it, you can’t miss the needed clue. The on-screen words pretty much tell you what to look for. Once you reboot, use your favorite search engine to find what the Internet says about this particular error. In all likelihood, it will be a bad driver, which can be easily replaced with a download from the manufacturer's website. But it could be something more difficult, such as defective RAM. I recommend MemTest86 for figuring out this problem. You can read my previous article for details on using it. This article originally published as an Answer Line column by Lincoln Spector on September 11, 2015.